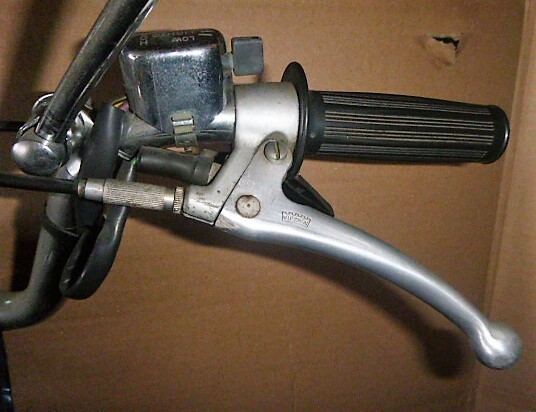 Some bolt-on controls have “deep” holes, where the mirrors need to have a longer threaded section. 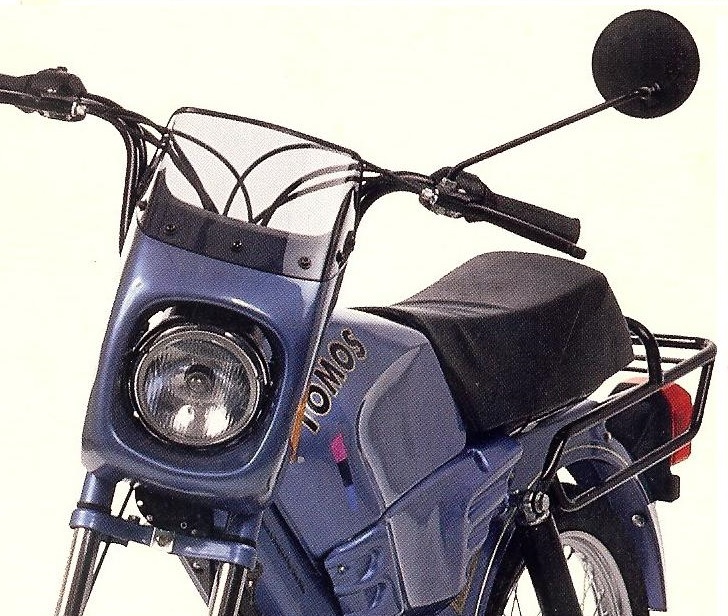 The HR controls on 1991-2007 Tomos need M8 bolt-on “deep” type mirrors. 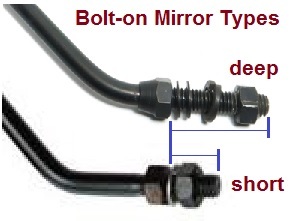 A “deep” type bolt-on can replace a “short” bolt-on, or a clamp-on, by repositioning the upper nut. Either type of bolt-on can replace a right hand thread screw-in. 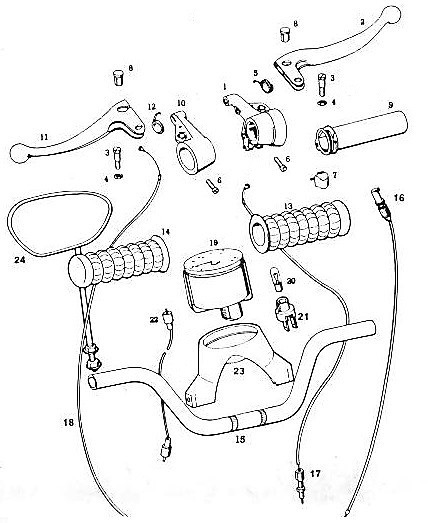 1978 to 2008: For three decades wise Tomos used the same part number 223255 for the mirror, even though the style changed five times (’78-80, ’80-86, ’87-91, ’89-00, ’01-08). So if you wanted to get a matching mirror for the other side, you could only get one for a few years. If you waited too long, the replacement mirror would be a newer style. 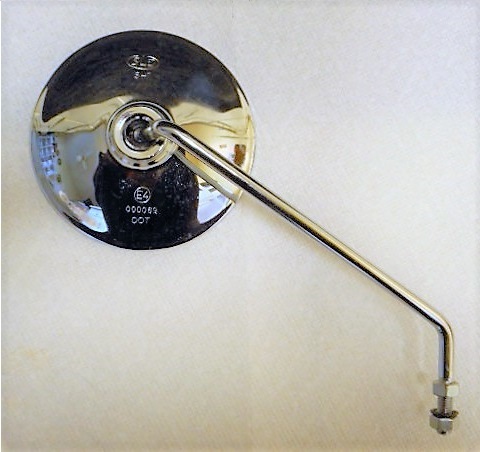 These 223255 mirrors were all reversible, where the glass can be made to face the reverse direction, so they work on either the right or left side. N/A means not available. 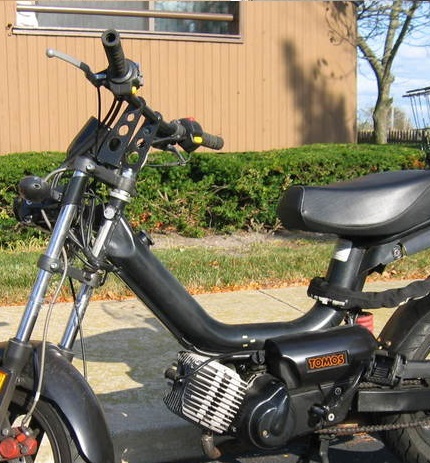 All US-model Tomos moped mirror types are shown here, but not all are for sale. 2008 to 2013: Many design changes happened in 2008. 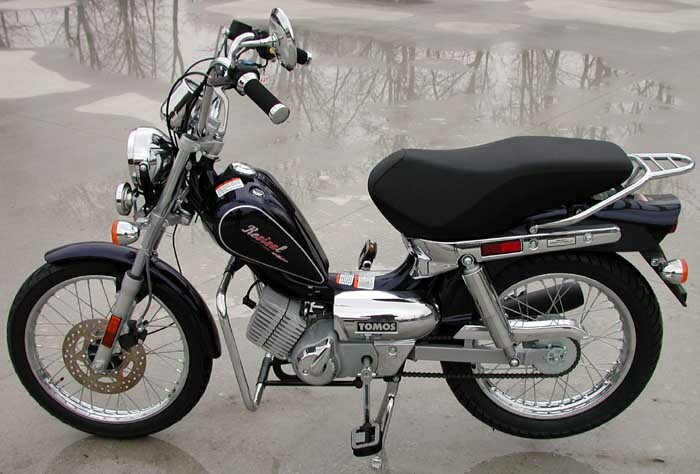 Non-reversible screw-in mirrors were on all 2008 Tomos models, where in 2007 they were only on Revival, Streetmate, and Arrow. 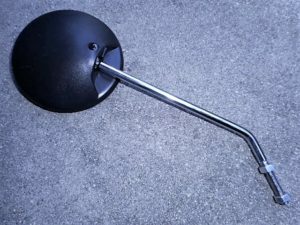 On those models, the Italian way (left thread) of threading a right side mirror changed to the Asian way (right thread). 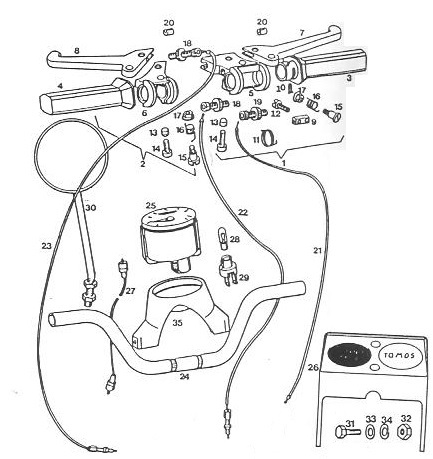 Add to that confusion, a “wheel of fortune” with 100 slices, 98 rights and 2 lefts, that determines whether a new bike will get right or left hand threads, in the right mirror hole. 98% of the time, the wheel lands on “right”, but 2% of the time it lands on “left”. 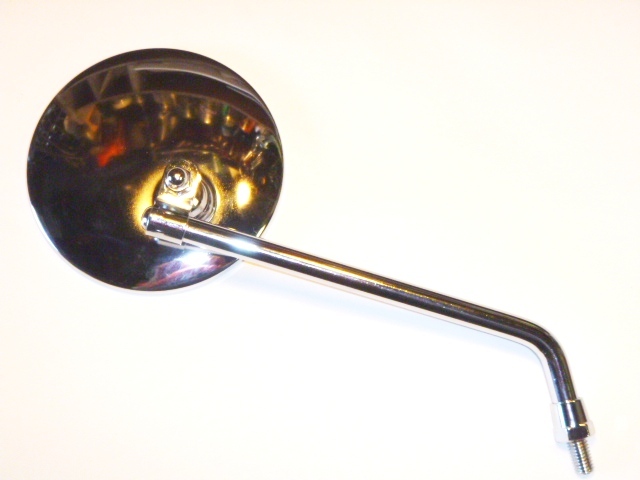 RH and LH threads: Screw-in mirrors sometimes have left-hand threads. That means they screw-in the opposite direction. 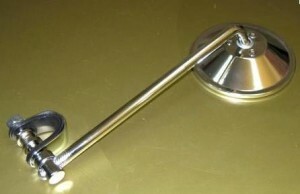 A right hand (RH) thread screws in clockwise. A left hand (LH) thread screws in counter-clockwise. 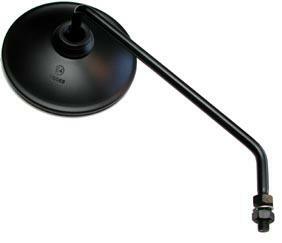 This mirror is a clamp-on, reversible. It has an irregular rounded shape with a white border. This mirror is a bolt-on, reversible. It has the same irregular rounded shape, but with a black border. 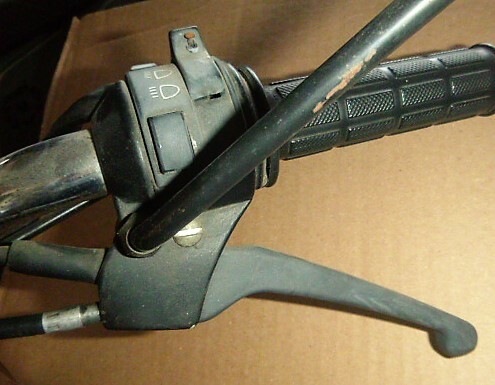 It can also be a clamp-on. This mirror is a bolt-on, reversible. It is circular and all black. The stalk clamps in the center of the circle. This mirror is a bolt-on, reversible. 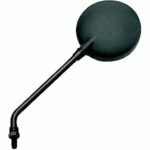 It is circular, all black, and rounded in the back. The stalk clamps at the edge. The glass is very convex, so objects are closer than they appear. Many become corroded, wavy, or foggy. 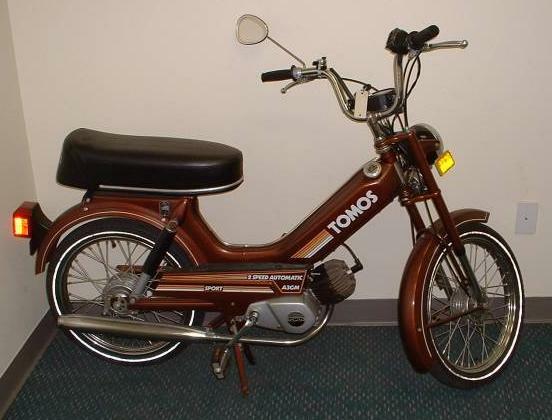 It is made in Slovenia by Tomos. E3 approved. This mirror was not used much. Most early 1990’s US models had round mirrors. That is why there is no photo. It is made in Slovenia by Tomos. E4 approved. 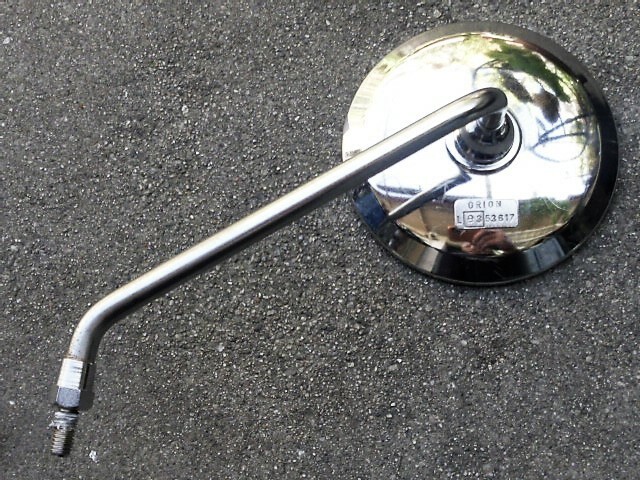 This mirror is a bolt-on, reversible. It is circular, all black, and rounded in the back. The stalk clamps at the edge. The shape is like a teardrop. This mirror is not convex, and has good visibility. 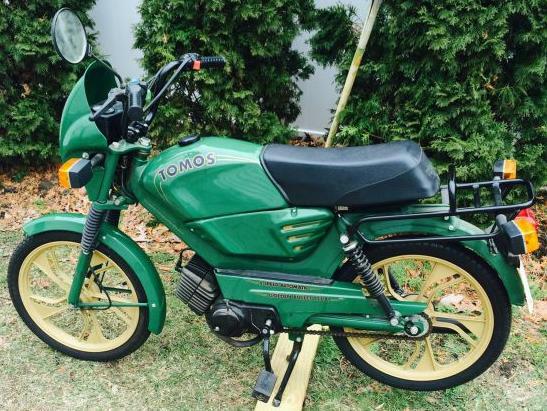 It is made in Slovenia by Tomos. E4 and DOT approved. These mirrors are left or right, not reversible. They are circular, all chrome, and almost flat in the back. The stalk is thick, 10mm. They are made by Orion. E3 approved. 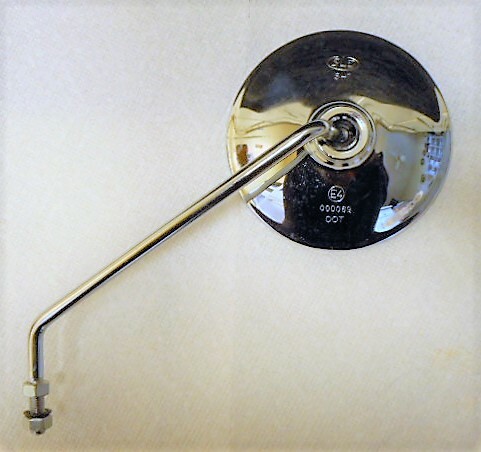 The replacement (spares) mirrors with the same part number were the later style made by SLD. These mirrors, left and right, are circular, all chrome, and rounded in back. The stalk is thin, 8mm. They are made by SLD. E4 and DOT approved. 236968 supersedes 232759 236967 supersedes 232988. 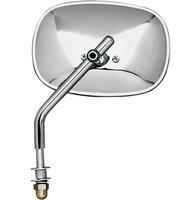 This left mirror is screw-in, circular, all chrome, and rounded in back. It is made by SLD. E4 and DOT approved. These mirrors, screw-in left and right, are circular, all black, and rounded in back. They are made by SLD. E4 and DOT approved. 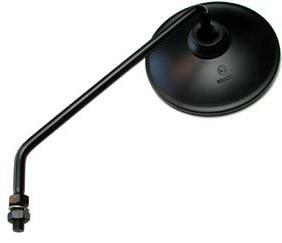 This left screw-in mirror is circular, all black, and rounded in back. It is made by SLD. E4 and DOT approved. 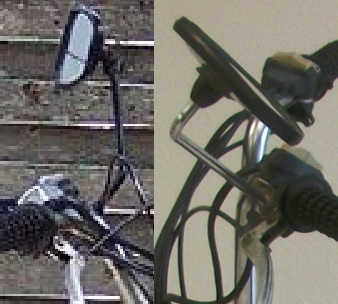 None offered: Around 2007 Tomos USA changed the screw-in mirror descriptions to 236965 MIRROR BLACK RHM LHT, 236966 MIRROR BLACK LHM RHT, 236967 MIRROR CHROME RHM LHT, 236968 MIRROR CHROME LHM RHT to say what side and what thread. But the actual part labels printed in Slovenia on the non-reversible mirrors still said MIRROR CHROME (REVERSIBLE) or MIRROR BLACK (REVERSIBLE). 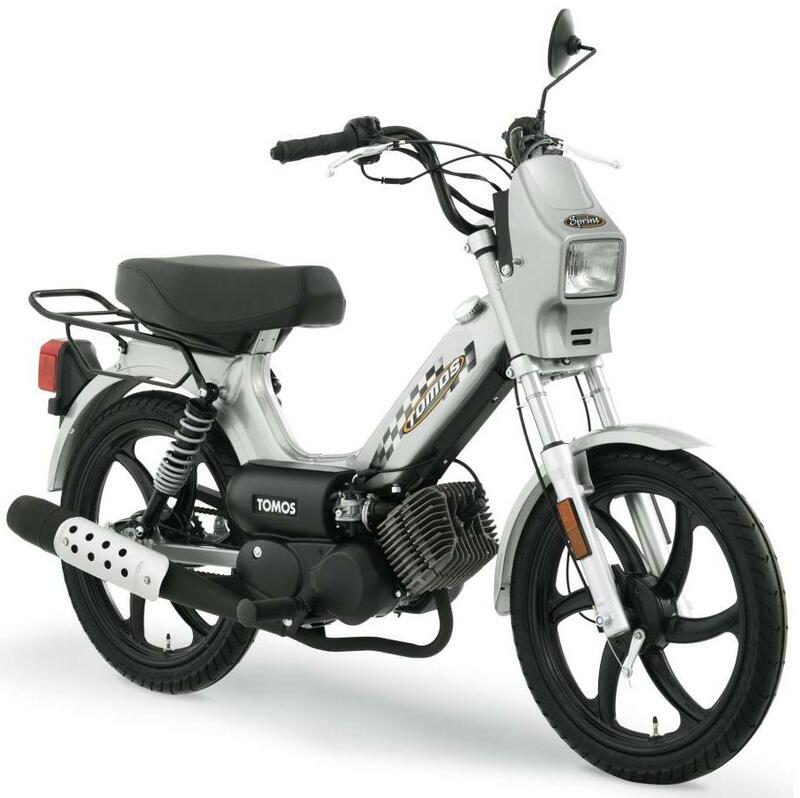 Tomos did not supply matching right hand mirrors RHM with right hand thread RHT, for 2008 and later, to the Tomos USA inventory. 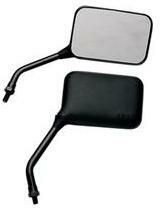 So the only matching right and left mirrors for a 2008-2013 Tomos moped (US model) are aftermarket mirrors. 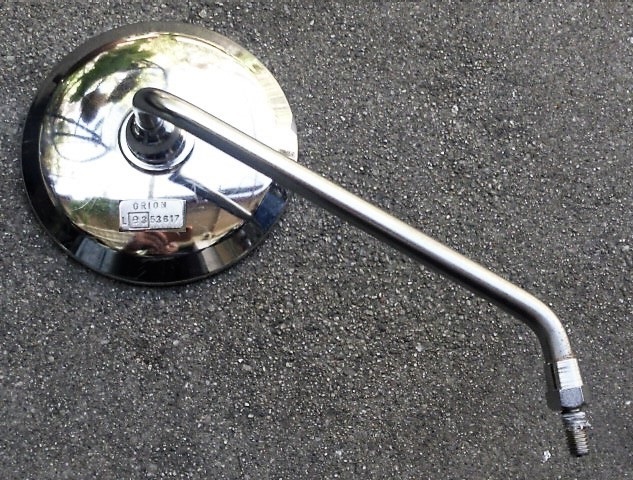 Twisting: One way to get a matching right mirror is to twist a 236966 black or 236968 chrome left mirror 180 degrees. This makes the straight stalk curved and leaves vise marks. If done carefully the marks and curve are not noticeable. The chrome tends to crack and does not “like” the twisting as much as the black. 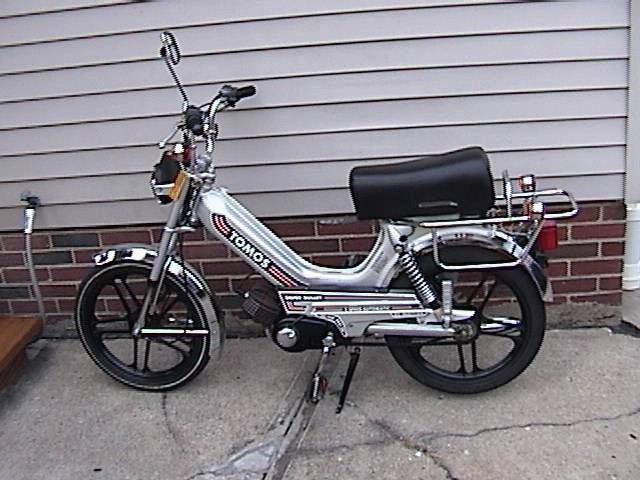 This is how Myrons Mopeds supplied matching right side RH thread mirrors, dozens of times, that Tomos did not offer. 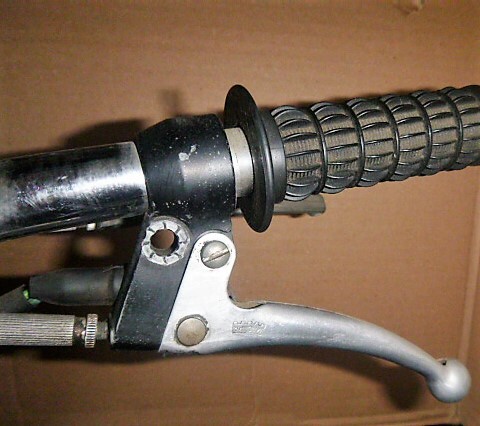 Wheel of fortune: For 2008-13 models, besides the incorrect labeling and lack of spare rights, Tomos somehow combined the supply of TBS (Domino clone) right control housings, right hand thread, with Domino right control housings, left hand threads. 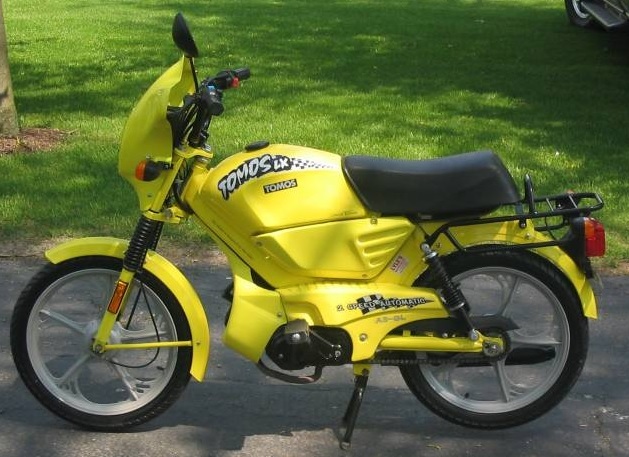 Some, like 2%, Tomos bikes had LH thread, while most, like 98% had RH thread. There is no way to predict which models, or years, or colors had the leftie mirror threads. This was only on the right side, thankfully. The left always had right hand M8x1.25 threads. Visually. If the threads get deeper in the hole as you go clockwise with your eyes, then it is RH thread. If the left side mirror (M8x1.25 RH thread) can also screw in the right side hole, then it is RH thread. If there is a M8x1.25 bolt available, it can be used as a tester. If it can screw in, then it is RH thread.